Teeth in a day" is an established treatment modality with a well documented success rate of over 95%. Traditionally, after a dental implant is placed, there is a 2-4 month waiting period prior to proceeding with the placement of the restoration to allow for the surrounding bone to attach to the implant (osseointegration). "Teeth in a day" technique implants are restored with a temporary or sometimes final restoration at the time of placement (to be more precise - within 48 hours from the placement of the implant). This technique is safe and predictable in select cases. 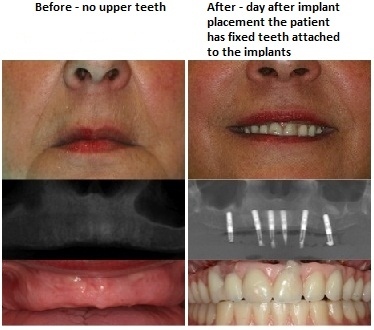 The main benefit is avoiding the phase of having an edentulous area while waiting for the implant to integrate. Certain criteria are required to be able to apply this technique to an individual case. After the initial evaluation, Dr. Pritsky will discuss with you the option of having "Teeth in a Day" if your case is appropriate.